The night before the game, I saw Amari at the hotel and we were just sitting and talking. I said, “Man, I really think you can do this. I think your team can win it all. If you guys do win it, this will be a special moment for you and just enjoy it.” At that moment, I had to wipe away my tears and give him a big hug. I told him that years later we will realize how significant this is. This will be something we can share forever. As father, you always want better for your kids than what you had. You want your kids to experience the things you experienced, whether it’s getting married or having a child. But it’s very rare your kids actually get to experience exactly what you experienced. So for Amari to win a national championship, he now has a direct connection with me. If I start reminiscing, he can go, “Yeah, that is how our season was.” My team was undefeated and the first BCS national champion and his team was the first College Football Playoff undefeated champions. There are so many different storylines, and that really makes it special. It’s just a different deal for me being able to have a child that experienced exactly what I experienced. I remember when we went back to Knoxville for a 10-year reunion of our national championship. Amari was obviously very young, and we did a Vol Walk and people were asking me for my autograph. He is young and didn’t really know any better and said to me, ‘Dad, one day people are going to ask me to sign my name too.’ I said, ‘You are right son. If you keep working hard, you can sign your name too.’ I always told him that story jokingly throughout the years. Once he got to high school and was having success, I started looking at the tape as a dad and thinking, ‘Man, he is real good.’ But I am a coach and told myself, “Don’t be that dad.” But looking at the film and evaluating him as if we were recruiting him, I started to really realize he can really play. It got to the point where he came to a summer camp at USC and blew it up. Steve Sarkisian was the coach at the time and he offered him a scholarship. I told Amari, ‘Son, this is because you deserve it, not because your dad works here.’ I told him if he continued to work hard he was going to get a lot of other offers and be a big-time player. He started going to summer camps and having a good showing and he started getting offers. People started seeing what we were seeing. I loved the way Amari approached the process. He was quiet and really humble and just continued to work hard. He never got caught up in it. He just focused on getting better, and once he made his commitment to Dabo Swinney and Clemson he was solid. He didn’t take any other official visits or home visits with other schools. He locked down on Clemson. He is a very committed person. For me as a dad, that is the part I was most proud of because I am in this business and I see kids drag schools through the process and make last-minute decisions with hats on the table and all of that. I told him we weren’t doing that. He handled it the right way. Amari really had a goal of becoming a starter this season and knew he had to get better because Clemson’s receiving corps is really strong. I told him to just get to work and let the chips fall where they may. Every day, he was sending me videos of him in the indoor facility by himself running routes or catching balls. He was there early in the morning and late at night. He came to California for a visit, and all he wanted to do was work on route running. I’d throw him the ball and his younger brother, Kaden, would throw him the ball. It was so cool for me because I am at the age where I can still throw the ball to him. I am in the business of coaching wide receivers, and to see my son having success in the business I am is just very special from a father’s perspective. I was able to go watch Clemson play against Wake Forest during our bye week. They blew them out, and I told Amari if they continued to play like this they would be playing for a national championship. He jokingly said to me, “I’ve got to get one. I’ve got to get more than you.” I told him, “Hey, just focus on getting the first.” I knew how hard it was to be undefeated, and now teams have to win 15 games. That is really hard. It was hard for us to win 13 games. I was actually sitting in a section filled with Alabama fans during the national championship game because that is where I was able to get my ticket at. They were good Bama fans. We all chatted.They knew I was from Mobile, Alabama. They knew I was cheering for Clemson and my son was on the team. It was just a weird thing because all year the No. 44 was prominent for me and I had no idea why. It always came up. It actually kind of freaked me out. I would look at my watch and it would say 1:44 and then 6:44. My favorite album of the year was Jay Z’s 4:44. Near the end of the game, Clemson had 44 points and they were driving down the field. I told my friends they were not going to score even though they could have put points on the board. My buddy goes, ‘What do you mean? They are at the 20-yard line.’ But I knew they would stay on 44, and sure enough Dabo let the clock run down, called timeout and kneeled in the red zone to stay at 44. I just kept thinking this was supposed to happen. I don’t know what sign 44 is, but it just followed me throughout the year. It was super weird. It was so weird I told my wife about it and even started looking it up in horoscope books and different things about significant numbers. It was that deep for me all year. Even Alabama having 16 points is 4 x 4. Crazy right? It was almost prophetic. Once the game ended, I watched the confetti fall on the field and started videotaping from the stands. I was just so proud of Amari and his team. I really like Dabo a lot and what he does for young men, and Woody McCorvey is on the Clemson staff. Woody was at Tennessee when I was in college and helped recruit me out of high school. He’s been a mentor for me through my life, even after leaving Tennessee. Having my son, Woody and Dabo on that team just made it super special for us to experience that together. 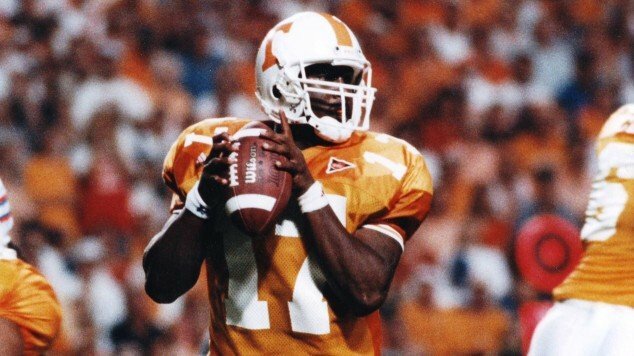 Tee Martin led the Tennessee volunteers the BCS National Championship in 1998. I walked back to the hotel from the stadium after the game and sat on a bench outside the Convention Center. Clemson was staying at the hotel and doing a reception at the Convention Center, and I remember us having the same kind of reception during our national championship. I knew the buses would pull up and there would be a few moments where we could just hang out before it got really crazy. We sat there for two hours waiting for the bus. It was cold and chilly outside, but eventually we saw the buses and the cops coming with all their lights on. I started recording them pulling up and Dabo, Amari and Woody walk down the steps of the bus and I just thought to myself, “This is how it’s supposed to happen this year.” Everybody just hugged and took pictures and enjoyed the moment. At the hotel after all the celebrating, Amari, Kaden and I were all together. Amari and I were taking a picture, and we wanted Kaden to get in the picture. Amari looked at Kaden after we took the picture and said, “Hey, no pressure bro. You have to join the fraternity and get one now.” It’s cool to see how great of a big brother Amari is. He wanted his brother to have a jersey from the season, so he gave Kaden one and Kaden wore the jersey back home. It’s so good as a parent to see your kids not only be successful, but for them to be good people and value the good things. This week has definitely been special for our entire family. I am a very proud father. Getting to watch my son achieve something I achieved was truly unforgettable. Tee Martin began his coaching career at Morehouse in 2006 followed by stops at the High School level at North Cobb and North Atlanta High Schools in Georgia. In 2009 he joined the staff at New Mexico, followed by stints at Kentucky and USC, where he served as the Offensive Coordinator. 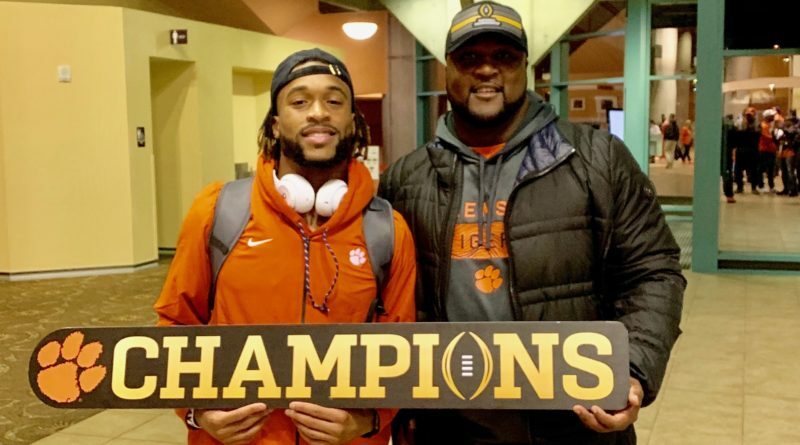 Tee is well known for his playing career, most notably his college years as the Quarterback of the Tennessee Volunteers where he was a two time SEC Champion and a National Champion in 1998 under coach Phillip Fulmer.